Pictured from left, Derek Henry, Isabella Bonzo, Cadha McKean, Ashleigh Miller, Jonas McCreedy, and Clay Montgomery. These GAHS FFA students went shopping for other students, buying both clothes and gifts. 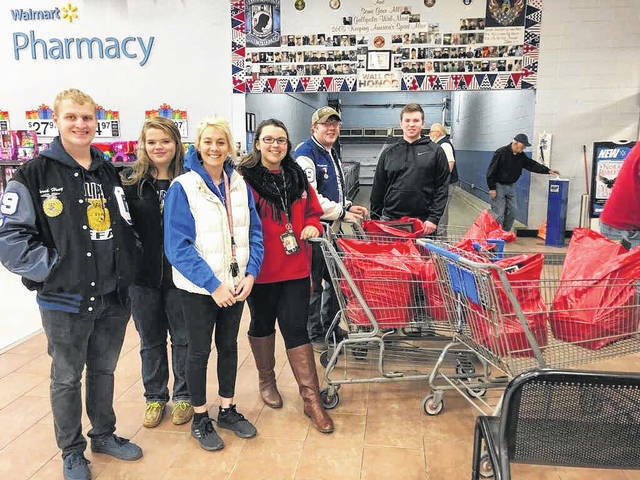 GALLIPOLIS — Gallia Academy FFA students are spreading the Christmas spirit this year by purchasing gifts for students. Students began collecting donations from their FFA members two weeks ago, gathering $536.17 which the chapter matched, totalling over $1,000 to spend on fellow students. This is the third year that the Gallipolis FFA chapter has donated charitably to students for Christmas. This year they bought for eight students; ranging from high school down to second grade. The students enjoy giving back to the community and helping others enjoy the holiday season. “Because it’s good for people around here who don’t have enough money to get the kids Christmas presents,” said Isabella Bonzo, FFA member. According to Katherine Dickson, agricultural studies teacher, charity is a foundation of being in the FFA. Both the motto and creed mention giving back and public service, as does the curriculum they study.